Necessity for accessing simultaneously a file system, by multiple nodes for read/write operations has became a requirement in various environments nowadays in the IT world. There are different scenarios for such implementations, but the one that particularly made us research the topic was the need to provide a simultaneous read/write access for multiple nodes to a file repository, which resides on a SAN system. In this article we will review how Red Hat's GFS2 clustered file system, built on top of an iSCSI SAN, could be used as a solution to this requirement. Below we'll review in more details the diagram of the solution, the hardware, the software, the configuration files of the software and finally we'll explain step by step how this was brought together. The above logical diagram shows how each of the nodes, which will be participating in the cluster are connected. 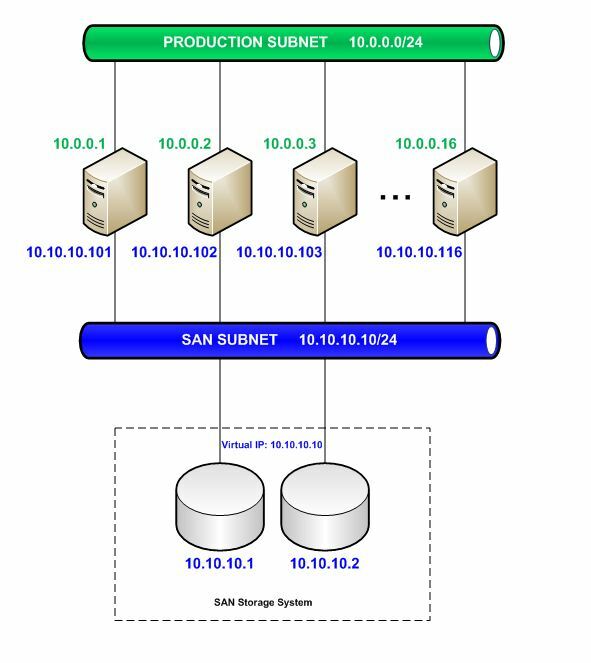 There are 2 subnets - Production Subnet, which will be the subnet that will serve the connections from clients, and SAN Subnet, which will connect cluster node servers to the SAN storage system. Addressing scheme, which we're using, is also available in the diagram. Please note that the SAN Subnet is running on top of 10Gb Ethernet network, while Production Subnet is running on top of 1Gb Ethernet network. For more information on unattended Linux installation with Anaconda there will be a separate article. For now you could read here for more details. As a prerequisite of the node setup we have to have the SAN setup, before we continue with the configuration. The configuration of the SAN is out of the scope of this article and will be explained in another one, but we'll mention here at least that we've created a LUN on the SAN storage system, which is configured to grant read/write access to all nodes based on their iSCSI Qualified Name (IQNs). In order to grant correctly this read access we have to make sure that the IQNs are correctly setup on each node. This could be controlled by the /etc/initiatorname.iscsi file. The next configuration file is the /etc/cluster/cluster.conf one, which is required for the cman service. In this file we list all cluster nodes and define the fencing mechanism, which we'll be using. In our case this will be fence_scsi, which will use the sg3_utils to use SCSI3 persistent reservations. Please note that in order to have this configuration file working we have to complete first the above step and edit /etc/hosts file to contain all node host names. is used to fine tune the GFS2 locking performance. Without this part we might experience serious performance deterioration. IMPORTANT!!! This configuration file has to be the same on all nodes of the cluster. After we create the file on one of the nodes we have to copy it to all other members of the cluster. Now that we have all of the four nodes setup, and the above configuration provided we could move further towards the actual explanation of how all of the above will be made working. Now that we have the SAN LUN visible on all of the nodes and both /etc/hosts and /etc/cluster/cluster.conf distributed to all nodes, we could move further with the cluster setup. The command output shows us that all the nodes are online, and we could see which is the node, on which we're running the command. !Please note that the above command is for all of the nodes! !Please note that above steps are performed only on the first node of the cluster! mkfs -t "file_system" -p "locking_mechanism" -t "cluster_name":"physical_volume_name" -j "journals_needed. This_ is_equal_of_the_nodes_in_the_cluster" "location_of_file_system"
!!! Please note that this command have to be executed only on one of the cluster nodes, and shouldn't be executed on the others! With this step we're now ready to use this recipe for exploring further the GFS2 clustered file system possibilities.